The Global Volcanism Program has no activity reports for Aniakchak. The Global Volcanism Program has no Weekly Reports available for Aniakchak. The Global Volcanism Program has no Bulletin Reports available for Aniakchak. 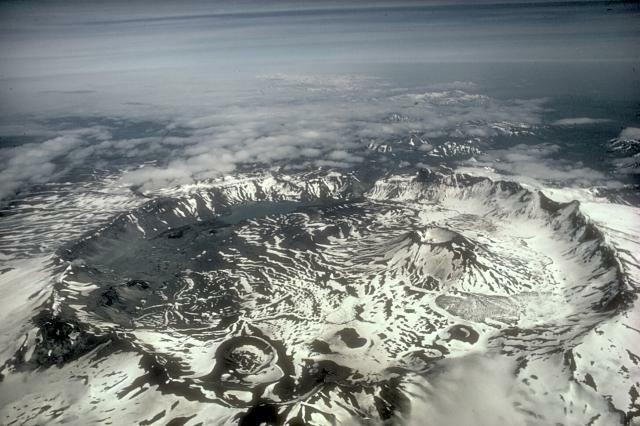 One of the most dramatic calderas of the Aleutian arc, the 10-km-wide Aniakchak caldera formed around 3,400 years ago during a voluminous eruption in which pyroclastic flows traveled more than 50 km N to the Bering Sea and also reached the Pacific Ocean to the south. At least 40 explosive eruptions have been documented during the past 10,000 years, making it the most active volcano of the eastern Aleutian arc. 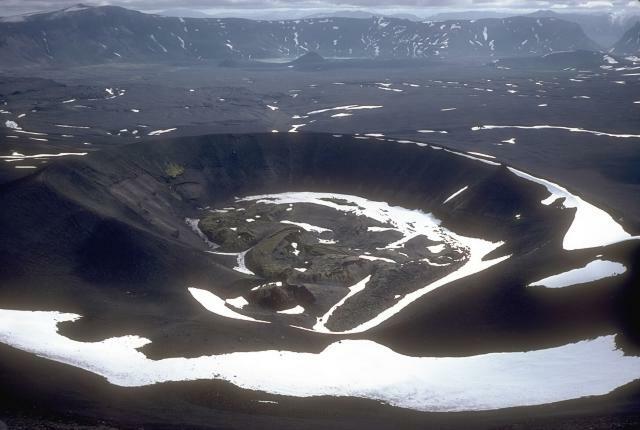 A dominantly andesitic pre-caldera volcano was constructed above basement Mesozoic and Tertiary sedimentary rocks that are exposed in the caldera walls to elevations of about 610 m. The ice-free caldera floor contains many pyroclastic cones, tuff cones, maars, and lava domes. Surprise Lake on the NE side drains through The Gates, a steep-walled breach on the east side of the 1-km-high caldera rim that was the site of catastrophic draining of a once larger lake about 1850 years BP. Vent Mountain and Half Cone are two long-lived vents on the south-central and NW caldera floor, respectively. The first and only confirmed historical eruption took place in 1931 from vents on the west and SW caldera floor. Bacon C R, Neal C A, Miller T P, McGimsey R G, Nye C J, 2014. Postglacial eruptive history, geochemistry, and recent seismicity of Aniakchak volcano, Alaska Peninsula. U S Geol Surv Prof Pap, 1810: 1-74. Dreher S T, Eichelberger J C, Larsen J F, 2005. The petrology and geochemistry of the Aniakchak caldera-forming ignmbrite, Aleutian Arc, Alaska. J Petr, 46: 1747-1763. McGimsey R G, Waythomas C F, Neal C A, 1994. High strand and catastrophic draining of intracaldera Surprise Lake, Aniakchak volcano, Alaska. In: Till A B, Moore T E (eds) Geologic Studies in Alaska by the U. S. Geological Survey in 1993, U S Geol Surv Bull 2017: 59-71. Neal C A, McGimsey R G, Miller T P, Riehle J R, Waythomas C F, 2001. Preliminary volcano-hazard assessment for Aniakchak volcano, Alaska. U S Geol Surv Open-File Rpt, 00-519: 1-35. Smith W R, 1925. Aniakchak Crater, Alaska Peninsula.. U S Geol Surv Prof Pap, 132-J: 139-149. 1050 (?) Unknown Confirmed Tephrochronology Vent Mtn and other vents? Remarks: Variable rates of subsidence are observed at Aniakchak. Reference List: Lu and Dzurisin 2014, Kwoun et al. 2006. There is no Emissions History data available for Aniakchak. 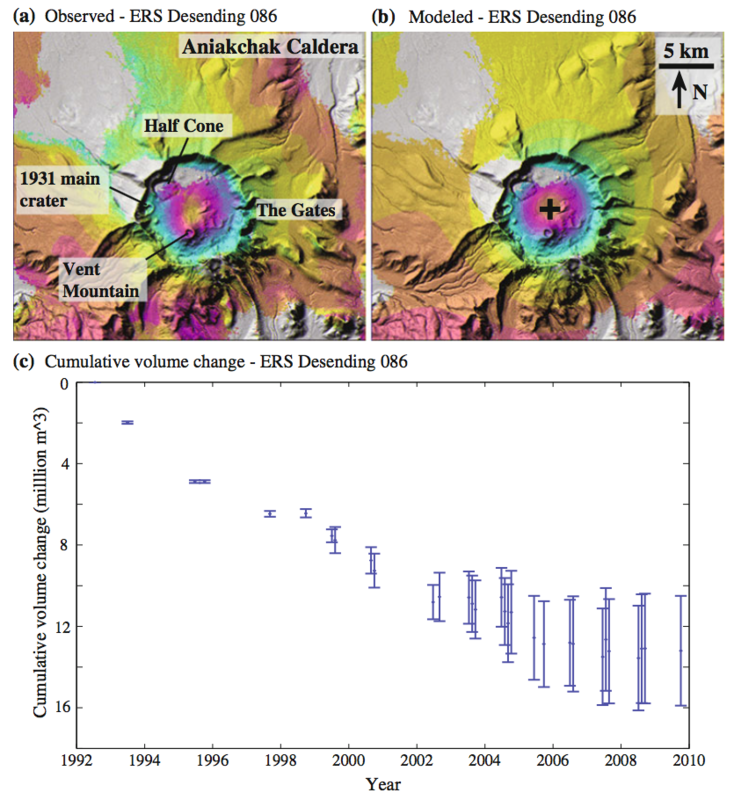 Calderas are very large depressions that form by collapse. Many, like this 10-km-wide caldera that truncates Alaska's Aniakchak volcano, are created by very powerful explosive eruptions that empty a magma chamber beneath a volcano, causing it to collapse inward. Other calderas, such as those on Hawaiian volcanoes, are produced by collapse following major lava extrusion. Calderas often form incrementally, during widely spaced eruptions. Later activity can cover their floors with a wide variety of volcanic landforms. Photo by M. Woodbridge Williams (National Park Service). 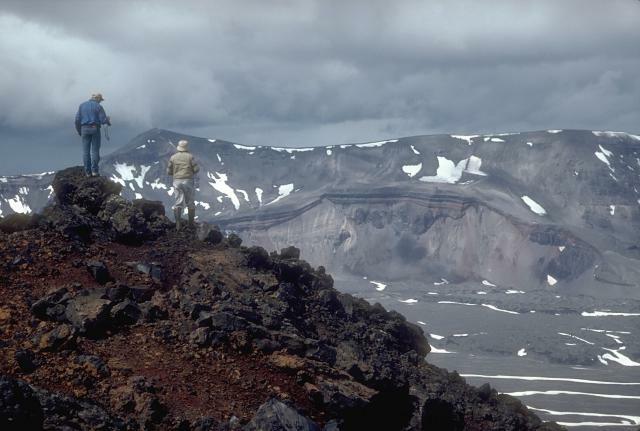 U.S. Geological Survey volcanologists on the rim of Vent Mountain, an intracaldera stratocone, look NW towards Half Cone, a prominent feature on the caldera floor and the source of the most-explosive post-caldera eruptions at Aniakchak. The aptly named Half Cone, whose SE side is missing, last erupted about 500 years ago. 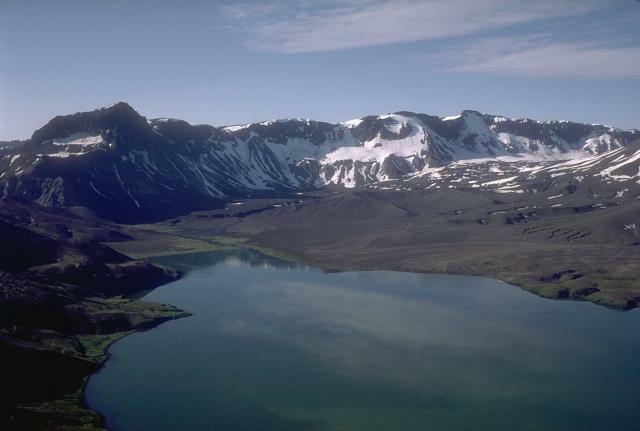 The NW caldera rim of Aniakchak caldera forms the skyline. 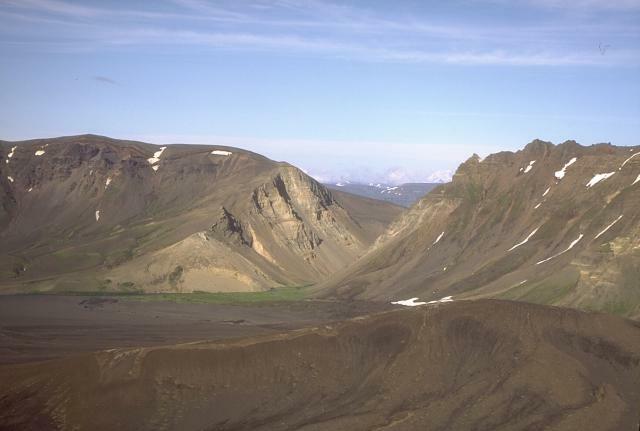 This view looks south across the caldera from the north rim of Aniakchak. Surprise Lake and its outlet are visible at the upper left. The prominent dark peak on the skyline is Black Nose, a high-standing remnant of pre-caldera volcaniclastics. Hummocky ground in the distance against the caldera wall is a pumice-covered glacier and associated moraine. Surprise Lake once covered a much larger part of the caldera floor before catastrophically draining through a notch in the east caldera rim. Photo by Tom Miller, 1985 (Alaska Volcano Observatory, U.S. Geological Survey). The Gates is a v-shaped notch in the 1-km-high eastern rim of Aniakchak caldera. Surprise Lake, now restricted to the NW part of the caldera floor, was once much larger. It is thought to have drained catastrophically through The Gates at the time of an eruption at Half Cone about 500 years ago. 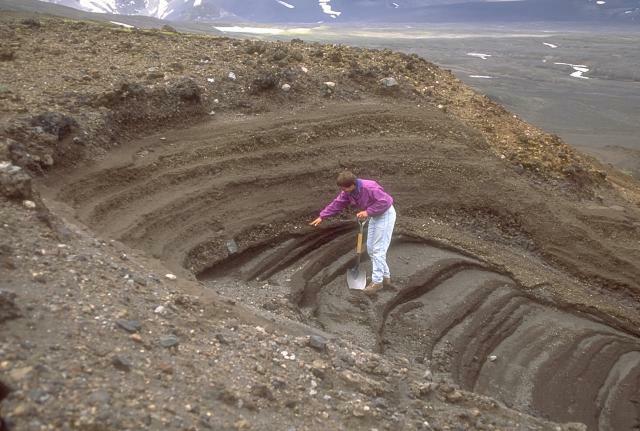 Photo by Christina Neal, 1994 (Alaska Volcano Observatory, U.S. Geological Survey). A geologist examines pyroclastic deposits (above hand) from a violent eruption of Half Cone less than 500 years ago. The Half Cone layers overlie dark gray phreatomagmatic deposits from Surprise tuff cone in Aniakchak caldera. The Half Cone eruption produced about 1 cu km of tephra, and resulted in truncation of the SE side of the cone. The primary 1931 eruption site is nestled against the NW wall of Aniakchak caldera. This crater, about 600 m across, was the site of intermittent explosions of pumice-lithic tephra over the course of several weeks in May and June, 1931. During the final phases of the eruption, a small lava flow and spatter field formed in the bottom of the crater. The 1931 eruption occurred along a fissure cutting through Vent Mountain and across the caldera floor to the west caldera wall. Large Eruptions of Aniakchak Information about large Quaternary eruptions (VEI >= 4) is cataloged in the Large Magnitude Explosive Volcanic Eruptions (LaMEVE) database of the Volcano Global Risk Identification and Analysis Project (VOGRIPA).